WASHINGTON, D.C. -- Nearly three in four working Americans (73%) say the rising use of artificial intelligence (AI) will eliminate more jobs than it creates across the country. However, a far smaller percentage of these workers (23%) say they are "very" or "somewhat" worried that they will lose their own jobs to this new technology. * Due to rounding, some percentages may add to more than 100%. Employed Americans with less than a bachelor's degree are almost twice as likely to feel their jobs are at risk as are those with a four-year degree or more, 28% vs. 15%. 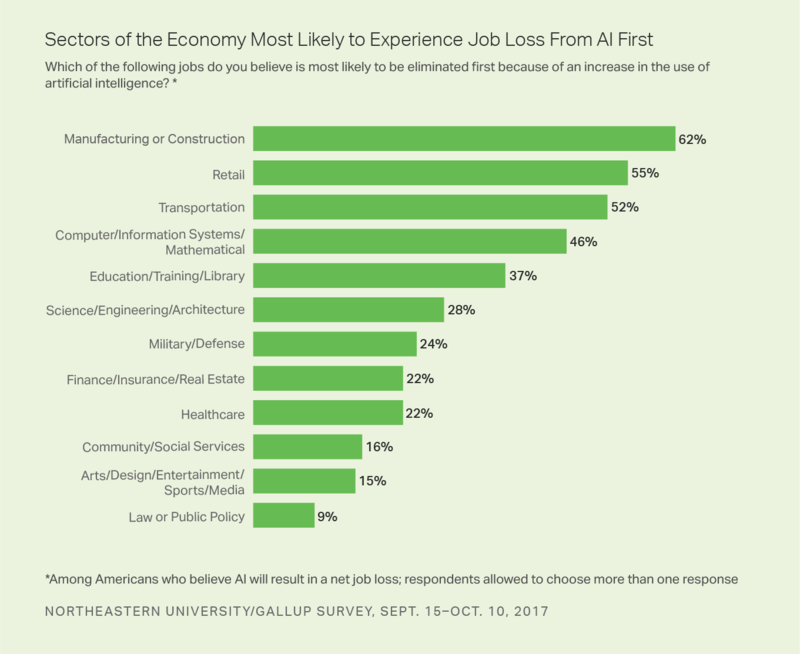 Americans with less than a bachelor's degree are also less optimistic about the impact of AI in general and may feel that their own lower education levels leave them vulnerable to job loss attributable to the new technology. Read the full Northeastern/Gallup report "Optimism and Anxiety: Views on the Impact of Artificial Intelligence and Higher Education's Response." Results for the Northeastern University/Gallup survey on artificial intelligence are based on surveys conducted by mail from Sept. 15-Oct. 10, 2017, with a random sample of 3,297 U.S. adults aged 18 and older. The survey package included an English and a Spanish survey to provide respondents with the flexibility to reply in their preferred language.